Space Marine gets cozy with the entire Dawn of War series in a $99 bundle. Those big bucks burning a hole in your bank account probably just found a new home. This weekend's Steam sale bundles all Warhammer 40,000 content for $99. Everything from the $1 DLC costumes for Dawn of War II all the way up to developer Relic's upcoming Space Marine come packaged together. By Steam's math, the whole shebang would typically cost around $160. With the included Space Marine running $50 for pre-order alone, it's practically a free third-person shooter on top of the huge pile of on-sale strategy games. The jury's still out on Space Marine, but this is still a tough proposition to beat regardless of how it turns out. If you opt against the big bundle, the entire Dawn of War II series runs at just $35; Chaos Rising and Retribution, as well as the original games, are all available at half-price. The promotion ends Monday morning at 10am Pacific. Early buyers of Space Marine on Steam also get a demo download immediately, on top of a free copy of Darksiders. 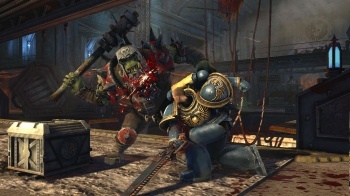 Space Marine releases for PC, Xbox 360 and PlayStation 3 on September 6th.